MicroFridge® is the original 3-in-1 refrigerator, freezer and microwave combination appliance that was designed for students in the “away from home college environment”. 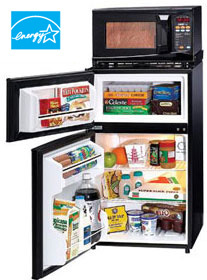 Key features of the MicroFridge® appliance include: 1) separate door real freezer, 2) SafePlug™ internal circuitry which draws less than 10 amps, 3) Energy Star rated –uses 30% less electricity to operate and 4) one plug operation…uses just one wall outlet. University Logistics offers convenient, easy full academic year rental plans to meet the needs of every college/university. Included are free delivery and pick-up, installation to the room, excellent customer service and maintenance. For further information about a plan for your institution, please call us at (800) 262-0101.